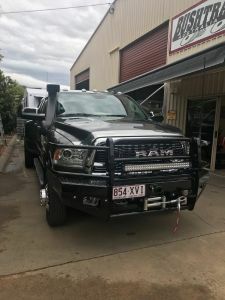 If any of you have been following my travels with my new Mega Land Yacht 23' Bushtracker, talked about in the Category WHAT SIZE OR TYPE OF BUSHTRACKER, then you will know I ordered a larger Dual Rear Wheel (DRW) 3500 Ram. Well it is here, and I am driving it, now with 700 kms on it. I have to say this is the best Ram I have ever owned and it drives tight like a car and very comfortable. My Wife Leslie has a bad back, on all sorts of treatments trying to avoid surgery, and She thinks it is the best ever as well! That is big! 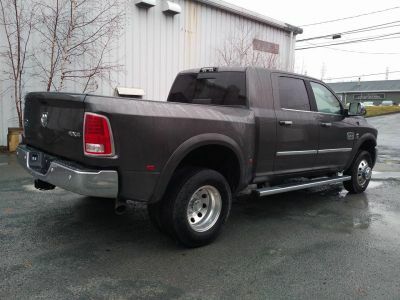 SCD claims it is the highest specification Ram they have ever imported. It is the Longhorn model, with the same top of the line equipment as the "Limited" edition, you know folding power mirrors, sunroof, all the fancy stuff but also Air Bag over suspension in the rear for automatic or manual load leveling. This is THE most top of the line I have ever owned. Why the DRW? Well with all the road armor ordered in front and rear bumpers and bars, and 15 ton Warn winch, and slid out with tool boxes and long range tanks (2) underneath and 200 litres more in a bed tank for 470 litres total, fridge freezer, and the rest, it will have a long ton of gear on board. 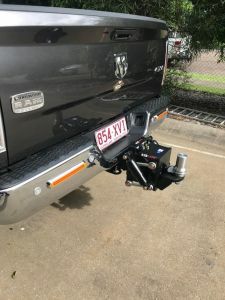 That and my overly well equipped 23' Bushtracker you can read about in the Category above, with 400 kg ball weight and a long ton of gear, I am at the top load limit for SRW single rear tyres. Also I want the ability to hog the whole rig up rocky terrain off-road with 6x6 and DRW traction, in search of gold fossicking. Note that: These are the extremes of both Bushtracker van and tow vehicle, and not necessary for the 99%. For example: We have 600 AH Lithium batteries that can run air conditioning off the inverter all day in sunlight with (6) 150 watt solar panels, without a generator and 4 hours at night. Further I am expanding on that with a 240 amp alternator on the Cummins 6.7, which if you have been reading about it here can idle long term without consequences to run 100 amp DC to DC charging to the Lithiums, make a generator almost obsolete. More on this to come.. This is waaaay overkill for most Bushtracker Owners. 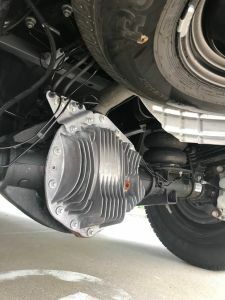 You can see the air cooled finned rear diff, this truck is designed to tow 13 tons. It even has a break in period for that diff. You can also see the Air Bag suspension over the springs if you look closely. This is a bit extreme, but not for what I want to do, and the load I want to carry. 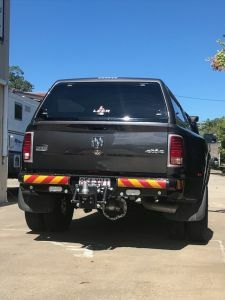 I will put more pictures on as it gets equipped..
SCD are really happy with the performance of the Nissan Titan, and they have such great confidence in the Titan, they are no longer going to take any orders for the Dodge Ram. 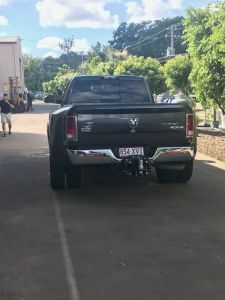 They are going to concentrate on the Nissan Titan until 2019 when they will start the prototype conversion for the new Dodge Ram Model that will be out here in Australia in 2020. I have put my hand up for that new Model, to star in the prototype conversion. I love this truck already, but I would not mind having the new Model on display at Bushtracker. Unfortunately, only those that have orders in now for the Dodge Ram, are going to get one from SCD. Mine is so tight it drives like a car, it is the best ever, but unfortunately there are no more coming in from the absolutely best conversion Specialists, until possibly late next year for delivery in 2020. That is sad if you want the best conversion, as now you are restricted to second hand to get an SCD Dodge Ram. I do not like the other conversions because of the extra steering arm and second steering box of the style of conversion done by the others. There is a Topic in this section where I show you the major difference..
Just broken in now at 800 kms and can start towing at low speed.. This is the first 2018 3500 MegaCab Longhorn in Australia that I know of. As a matter of interest, there is an additional 800 km run in for towing, just on this massive rear differential, and I cannot go over 80 kph.. I have never seen big cooling fins on a Diff like this 2018. What a great idea for top end towing capacity !!! This 2018 Ram drives tight and neat, more like a car. Looks like a crouching tiger with the big DRW rear end. I am very pleased so far and will start the run in process on this big Diff this weekend. It is about a 20 ton diff, rated to tow 13 ton plus 6.38 ton GVM on the 3500, and smooth as a car to drive. This may be the best ever for a Mega-Yacht larger overloaded 23' Bushtracker... 6 wheels driving, air over, and air suspension on the Bushtracker, gives me a lot of latitude with an Aisin transmission and the big Cummins.. Enjoy the reports, this is not a skite, but many Owners want to sort of follow the outer limits of R&D and what I am doing.. Certainly not necessary for most, but then again I am liable to go further off-road than most fossicking for gold.. I loaded my van up to over 4000 kg, with 7 tanks full, just to see how it all would go. This truck is amazing, with the Aisin Transmission it shifts and downshifts like a manual only it is an automatic. I went over 2000 kms with all that van on the back, and it almost felt like I was driving a 200 Series Landcruiser towing nothing. This is THE machine, a bit overkill for most, but with a big van like my 23', it makes the job easy. I think it is very unfortunate that SCD have elected to stop converting the Dodge Ram until the new model comes out, and are concentrating on the Nissan. No one else does such a good job, without adding another steering box and another steering arm, no one else does it this good. The engine bay is all original, I did my own first oil change before this trip at about 1000 km. I am "Old School" and I wanted to get the build grease and silicones, and fine sand from the castings of the build, out of the oil. Someone did an oil test on their Dodge Hellcat engine at 3000 kms, and the results made them wish they had done that Old School 500-1000 initial oil change as the traces of what I mentioned above were all in the oil. Anyway it made me feel good to do it, and with the original engine bay layout the oil change was quite easy. Someone has ask me: "I can't get a Dodge Ram from SCD, who would you recommend is second place/" I did not have a good answer. They all do the standard second steering box and cross arm conversion. Further the biggest conversion group, the Walkinshaw people, do not offer a MegaCab, or Duallie, or anything above the basics of the Laramie. They will not bring in a "Limited" or this "Longhorn" and some do not even have the towing mirrors on. Hi Steve, I am looking at a Dodge Ram and wandered what axle ratio you chose with the aison transmission? I will have close to a 2t payload in most of the time with roller shutter toolboxes for work. The addition of a van on the back to add to that. I am looking at a 3500 regular chassis cab with dual factory fuel tanks (280lt)and am after some advice. Plenty of YouTube info on it but guys towing large 40ft goosenecks and doing hotshots. A bit out of our league here to compare. Any advice through your experience with these trucks is welcome. I mean this is a full import, Walkinshaw does not do anything but the basics, no MegaCab, no Longhorn, no Limited, and all the rest, just the basic 2500 Lariat. My 3500 is rated to tow something like 33,000 lbs, and I have forgotten what gear ratio it is. . It is rated to 13,290 kg GCM here in Australia. You cannot get anywhere near that, and I don't think the small variance of gear ratio is going to be noticeable in any case.. Anything over 4500 kg and you need Air Brakes, a prodigious and expensive exercise. So anyway, I would say take what ever you can get, you will not know the difference. I don't even remember what my gear ratio is, but it runs about 14-1500 rpm at 100 km/ph. Anyway, I would not get all fussy about it, you are not towing a 45' fifth wheel where lower or higher gears might affect fuel economy a little. In our case it is just running on torque.. They are definitely a beast compared to Australia's offerings of Utes. Definitely will be a choice of mine rather than what I can get my hands on though I can assure you. Its quiet achievable these days to order what you want and bring it to Australia with many conversion specialists eagerly awaiting the work. The Ram is far superior for our towing needs however my payload needs are warranted in wanting a Ram 3500 Dually. I currently have an Isuzu 6.5t truck which is great but rough and the back pays for it, and I need in excess of 3500kg towing. The difference in axle ratio is substantial to the point that a 4.1 axle ratio will do approx 2500 RPM at 100kmh and the 3.42 and 3.73 much lower at approx 1500 and 1650 Rpm respectively from what my research digs up. This will account for fuel usage and loss of top speed dependant on choice of ratio. I think the 3.42 and 3.73 are my clear choices but I am uncertain as to the best choice, 4.1 is out of the question. I was merely wanting advice from someone doing roughly what I would be doing with mine, and curious as to what ratio is best. I agree though which ever one I get I will be stoked with and wouldn't know the difference, mainly because I won't have one of each! It will eat all offerings we have here....and be far superior to the Isuzu in every way, as honest as that truck is.... And the Landcruiser 70 series, my default choice for years, is not getting a look in this time round. Its a toy!! Most of them are in the 342 range for fuel economy. I think you have to special order the 411 rear end for big heavy towing like in America 45' 5th wheels. They do not have to run Air Brakes over there..
Now that you have mentioned it mine is the 342, running about 14-1500 revs at 100 km/hr. Anyway, you need to arrange the conversion here, and they can get you the truck. SCD in Brisbane do the best job, without adding a second steering box and cross over shaft, there is a topic on it. The comfort level makes the Japanese trucks look primitive, feel primitive, and way under powered. You will not look back after owning a Dodge Ram.. The GCM is also far higher with the Ram, mine is under rated and still at 13,290 kg GCM.. If you are going to try and import it yourself, good luck, you better have a Contract with them to convert it for you. Read the Topic and pictures on the Conversions here in this Category FYI.. Thanks for looking into that for me Steve, and yes I think the 3.42 ratio is all that is required. With you van on is it happy in top gear or always changing? Is there a possibility 3.73 axle ratio would be an improvement or simply not required? Did the air safe hitch not tick the boxes? HP and Torque you shouldn't have to worry about the lower ratio diff. I order a 2019/2500 Limited thru SCD am awaiting delivery. Interesting You Tube video on the RAM 2500 Super Tourer from Patriot. Great vehicle, but for that price I'd be expecting the full list of options to have been included as standard. Thanks for The info mate, yes I have been looking at that. I will stay with a chassis cab though due to factory dual fuel tanks and vinyl floor offering. I understand the chassis cab with be 370HP and 800lb torque whereas a pickup will be 400hp and 1000lb. I honestly believe they are starting to push the boundaries at 1000lb and am happy to have the same transmission and engine running 800LB. I think at this stage its 3.73 due to the standard offering on the pickup being 3.73. Anyone know about maracoonda conversions and how they compare to SCD? I noticed you were up at 1.49am replying to my last post, Im guessing too anxious to want to get back in the Ram to drive to work? This is what I am worried about happening to myself!! I am worried about the ride quality of a chassis cab vs pickup though. 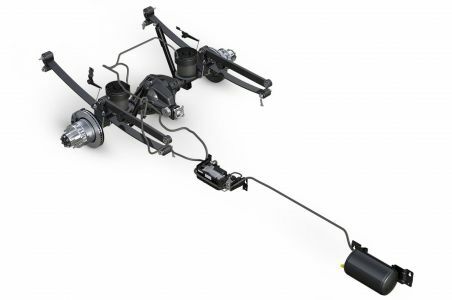 The chassis cab will come with a shorter length spring pack and more leaves to handle a constant weight. The pickup has less leaves, they are longer and also the pickup has an air level ride offering. I believe the level air ride offering will be trouble with more sensors and arms and gadgets going on, and potential point loading of the chassis than its worth anyway. Standard leaf springs for me I think regardless of pickup or chassis cab. My vehicle will have a constant 2t or more payload. Anyone comment on the above that has experience with both a pickup and chassis cab? You may be off on a lone tangent here... You said 2 tonne payload, like all the time?? Then you need a DRW 3500 for sure. You need the Dually to carry that much weight full time.. A SRW 3500 will be over the limits on single rear wheels. Also, I have been living with truck air suspension for some time. And the Air Suspension on my MAN Horse truck is now 7 years old, performing without a fault. These are proper trucks, and there is not much to go wrong with the full air suspension. 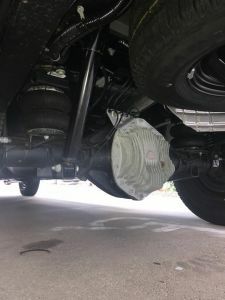 If you are lucky, you can find a 3500 DRW (Dual Rear Wheels) with the Aisin transmission, which is the best and most preferred tow truck transmission in the Industry, and a lot of them on air. Also luxury in the Limited or Longhorn, or MegaCab, all not available from normal Dealers here in Australia, it has to be ordered..
What you are talking about is the idea of a "Cab Chassis", how it has been called for about 40 years. Cab Chassis is how larger commercial and government trucks are ordered, and the end user has a special utility bed or body in mind for the truck. That is the commercial type truck, no comforts, steel wheels, no bed, and virtually no suspension hard riding work trucks. I do not believe you can make a success travelling with that in the Outback, it would beat you up too badly. I drove a Cab Chassis F-550, and I owned a full luxury F-450 King Ranch DRW pickup so to speak, and it is night and day the difference. Cab Chassis vehicles are made as commercial work trucks on the road like construction and government vehicles, and not suitable IMO as off-road vehicles. The luxury vehicle ends at the 3500. Mine is the Longhorn western interior, every luxury fitting Dodge has to offer, and has a GVM of 6351 kg, so that is your two tonne payload. GCM 13,290 kg but that is irrelevant to us here without air brakes. Anyway, that 3500 is the top of the line, any bigger and you get into Cab Chassis, in the 4500 and 5500, and they have like 50mm of spring travel to the bump stops and virtually no give in the suspension. 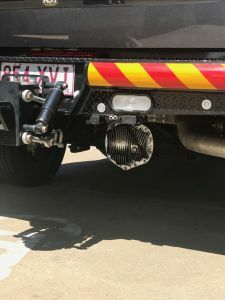 They are suitable for big commercial trucks and utility beds, like construction trucks, but are bitumen running vehicles that would near beat you to pieces on rutted or corrugated roads. And yes, 1-2 AM, sometimes I wake up for an hour or so and check the Forum among other things.. I have always called it chassis cab, not trying to recreate things! Have emailed some people in the states and chassis cab is the lingo, cab and chassis at times so excuse my American! You asked about my payload, yes 2T all day everyday on the back for work. My Isuzu truck Tares at 3.1 and runs around between 5.3T and 5.5T at any given time. I don't believe I am off on a tangent by any stretch, only the suspension is a worry on the cab chassis. All other areas of the cab chassis are spot on, Dual factory fuel tanks (not available on pickups), vinyl floor on a larrimie as a selection, Very easy to make a tray for with dead flat chassis rails. The dual fuel is a massive one , only a $400 option and sits between the chassis rails and increases capacity to 280lts. You are correct with the cab chassis being less luxurious in the 'PAST'!, however from 2019 they have included the Laramie and even the LIMITED on the cab chassis crew cab. There are other options on the cab chassis that you cannot alter on a pickup- The only possibly detrimental thing on a cab chassis is the SUSPENSION, and if you want the HO (High output 1000lb ft engine). For me 800lb ft which is over 1000nm beats any vehicle I have had by a large margin, like 2.5 times more than landcruiser V8 79 series. In regards to the AIR suspension, I still believe its a gadget. Not the Air side but the level ride side.... Level ride relies on sensors, arms coming from the chassis to the suspension I believe to sense if the vehicle is out of level (front to back or side to side), and it alters the ride height at any given corner. You could be on an off camber rd or towing a heavy trailer and it senses that. All I am saying is in my opinion its a gadget waiting to stuff up after warranty. I also dislike airbags, they point load a chassis. Sure the Ram can handle it or they wouldn't build it that way, or have it as an option- IMO I just don't think it is necessary. I like the idea of the level ride, but at the very least it involves more moving parts and still relies on leaf springs as the underlying load carrier. Just a preference and keeping it simple. A real concern the suspension side.... The only cab chassis concern I think.